I began visiting paranormal forums and putting my name out there, hoping to get a reply that wasn’t a total crank. Meanwhile I’d keep up with my regular job, just with an eye for some of the stranger things I found to add to the map. A few weeks later I ended up receiving a letter from an author who I later discovered was a big writer and editor in the non-fiction world. The first few emails she sent were probing me for questions and gauging if I was legitimate. I tried to explain what I was doing, and finally she consented to writing a letter detailing her strange experience. I have never met her in person, but I have spoken with her on the phone. I personally believe her story, since I could find no evidence of fiction written or published by her, and since she wanted to remain anonymous. I originally felt that I’d collect weird stories for the DNR sites I mapped, sort of a new American urban legends kind of deal. Now though, well now I’m mapping and recording anything I can find. I don’t exactly know why, but McGivern’s sincerity and the circumstances of his disappearance… well that’s something that I just can’t get to sit right for me. I transcribed the letter, and changed a few details just to help keep her anonymity, but the bulk of her experience remains the same. Thank you for reaching out to me. Originally I thought relating what happened to me would dredge up bad memories, but it’s actually a relief talking to someone who doesn’t think I’m crazy or made this thing up for attention. I appreciate you keeping my identity secret. This happened to me many years ago. As to what happened, well, we all like to feel safe in our own homes. You probably follow the same ritual that I do when preparing to go to sleep. Doors locked, windows shut, lights off. I used to think that a good sturdy front door and exterior lighting were enough to keep my house from being targeted by anything. The criminology course I took in college had a theory based all around that. If you make a building look hardened against break in or theft, criminals would instead bypass your house and hit the weakest one on your block. I always thought of this as true, if not a bit cruel. It almost seemed like a bit of Schadenfreude to me, hoping that your house would be left alone as misfortune was visited upon your neighbors instead. I’m a writer and editor by trade, and primarily work from home. At the time I was a bit embarrassed by that, because anytime I told people that I was a writer they would always ask if I’ve had books published or where they could find any of my articles. I usually said yes, but they’re hard to find, or I’m still working on editing a manuscript. I usually left out the fact that my work was hard to find because you can’t really find the operator’s manual for a Greyhound bus for sale in most Barnes and Nobles, but my job gave me time to work on side projects and kept a roof over my head. I lived in a small two-story house in a quiet suburb outside of St. Paul. We were blessed with beautiful summers, and cursed with the fury of Minnesota winters. My yard was huge for the area, over an acre, which is owed to the fact that my house was a renovated farmhouse. The first in the area from the research I did in the local library. 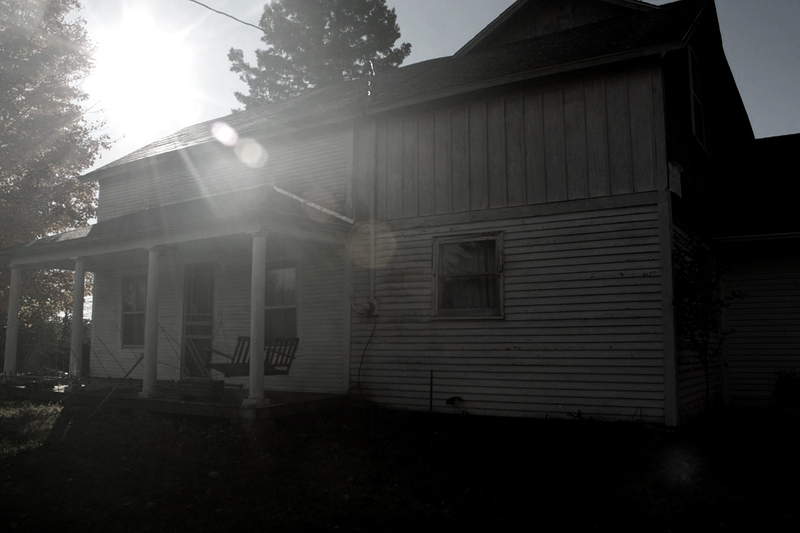 It had an old, rickety porch that I liked to sit on and write until I got too tired, and then go in and collapse in bed. At the beginning of the summer I was outside, enjoying a beer and working on what would turn out to be my breakout book when the sun finally set and the street lights came on. I had researched the history and evolution of witchcraft stories in America. My book covered everything from Navajo Skinwalkers up through the Salem trials and ended with the rise of Neo-Pagan religions. At that point I had been trying to force myself to write outside until either my battery went critically low, or the mosquitos were too much to handle. Anyways, I was sitting there trying to fight the writer’s block that is an author’s constant companion, when I heard a low mumbling coming from inside the kitchen. It sounded like someone left a radio on, but the station wasn’t fully tuned and the sound was only coming through in bursts. I stepped through a screen door and flipped on the kitchen light, and realized the sound was actually coming from the basement. The old door was closed, as it was when I had left it. I reached for the knob, listening and trying to decipher the words. Truth be told I was actually scared as hell. I tried to convince myself that it was an old boom box that switched on because power surge or something, but I could feel my skin crawl. I should have called the cops, but pride is one of those things that you don’t think will impact your decision-making in a crisis. Then it snapped into focus that someone was invading my personal space, my home! That’s what finally pushed me into grabbing the hatchet from the garage and opening the door to below. The basement was dark and cold and I descended the stairs as quietly as possible. I knew the layout of the basement and all the random things I had stored down there, so I wasn’t too concerned about bumping into anything in the dark. I gripped the hatchet so tightly in my hands that I could feel my skin chaffing against the wooden handle. As I waited in the dark, I realized that the words were coming from the old coal storage room that hadn’t been opened in years. When I moved in originally, the previous owner told me that the door to the coal room had either frozen in place due to the wood swelling or the house shifting. He wasn’t sure, but he hadn’t opened it in about 30 years. He said he didn’t store anything in there anyways, so I never thought much of it. This time I pressed my ear to the door, and strained to listen. The words sounded familiar, but I couldn’t place them. My tool bench has a pry bar that I use mainly to break up soil in my garden. The thing is basically just an iron bar with a spike on one end and a wedge on the other. It’s about 4 feet long and weighs about 45 pounds. I swapped my hatchet for the pry bar and jammed the wedge into the door frame. I heard the noises stop as I yanked back on the pry bar, and fell tumbling to the floor as the old door gave way with the splintering crack from the wood breaking. I quickly stumbled to my feet and realized that the coal room was lit by an oil lamp that had been left burning on the floor. Bundled up into a rough bed shape in the corner were some of the extra blankets that I had stored in the basement as well as bedding of wild tall grass from outside. In a neat pile on the floor were some of my missing clothes and jewelry. The room was empty otherwise. I raised my pry bar and walked into the room, noticing the large coal chute in the corner that lead to the outside. Looking upwards into the chute I saw a hint of light. While it was normally kept locked from the outside, this time it was open just a crack. Regardless, it is too steep and slippery to climb without any climbing gear, none of which I saw. I turned and looked at the broken coal room door, and realized that the frame hadn’t swollen at all. There was a piece of metal torn off and connected to the side of the frame. It was the remains of a locking bolt someone had put on the inside of the door. I was about to run out of the room and call the cops, like I should have done in the first place, when I caught a glimpse of a worn bundle of handwritten papers tucked in the pile of the tall grass. The handwriting was scratched and erratic, torn in places as though someone was pressing down too hard on the paper. It looked like an older draft of the manuscript I had worked on in my spare time. It was filled with corrections and strike throughs as though it was going through the editing process. The thing is I never actually printed my manuscript out or sent it to anybody. Hell, I had run out of printer paper a few months before, and since I work on everything digitally I just never bought any. The story had been stored on my password locked laptop this whole time. After the cops came and searched the house they hadn’t found anything they could use to locate whoever the hell was living in my basement. They couldn’t even tell me how long that I had potentially been watched. They had a couple of patrol cars drive by a few times a day for the next week, and I boarded up the coal chute and put a padlock on the coal room door. I was going to burn the pages I found in the basement when I noticed something familiar. All of the edits scrawled on the manuscript? They were the exact same edits I ended up with. In fact, they also included the edits I had planned on writing that night. Our correspondence concluded a few weeks later. She wrote to me that she ended up moving into an apartment in the city and started writing case studies about geopolitics in the 20th century instead, avoiding anything with a religious or occult bent. I added the address of the old house to my map, and waited for my next lead. While I was still going to work, I was distracted and was spending more time working on my personal map rather than the official DNR one. Since I was the primary person on the project, no one really noticed at the time. It was around this time I first started noticing the shapes that would dart in and out of my peripheral vision, appearing in random places wherever I went. They were nothing fully defined, just blurs of movement. I figured it was due to exhaustion, and wrote it off at the time, searching for my next contact.